Google: recursion. Gotta love when nerds throw in easter eggs for other nerds. Does anything really need to be said? Competition is a wonderful thing. There has been a lot of high-profile/0n-my-radar music released in the past few weeks, and for some reason only a small portion of it is living up to my expectations. 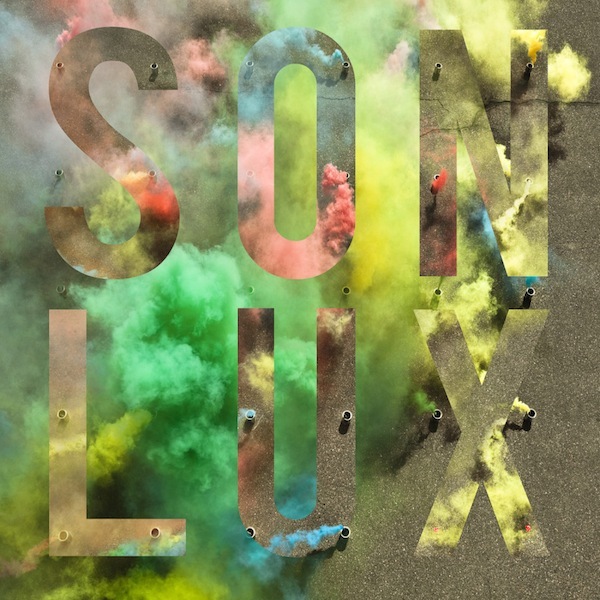 One album that surpassed what I expected is Son Lux‘s sophomore album We Are Rising. I’ve mentioned Son Lux before, but I really think that this new offering deserves further note. For an album made start to finish in 28 days, We Are Rising shines in so many different ways. I love the orchestral arrangements Son Lux (aka Ryan Lott) has put together. It’s obvious from the beginning that he’s a classically trained musician fully capable of composing very complex pieces, and he doesn’t shy away from his abilities. “Let Go” – a short track near the end of the relatively quick 38-minute run time – is one of my favorites not because of any pop sensibilities Lott shows off, but because of the fact that multiple tempos overlap through different instruments and phase in and out of each other until the end when tracks are stripped away until a simple beat is left. Other standouts include the bombastic “All The Right Things” and the Portishead-reminiscent “Leave The Bones.” But We Are Rising really should be listened to in its entirety. I’ve gone through it many times since its release last month and don’t plan on letting it slip out of rotation any time soon. Lott’s deep constructions will give me new facets to discover for quite some time. So I just turned today into a depressive Portishead day. This song is by far the most abrasive track from their most recent album Third. It was the album’s first single, and it heralded the return of one of my favorite bands back in ’08. “Machine Gun” kills me every time. This is just a short story of how extraordinary the internet is. At around 7:20pm tonight (May 1, 2011), I’m sitting at my desk playing Starcraft II, and a notification from the Huffington Post pops up on my iPhone. It says that Obama is to make a surprise statement at around 7:30pm. 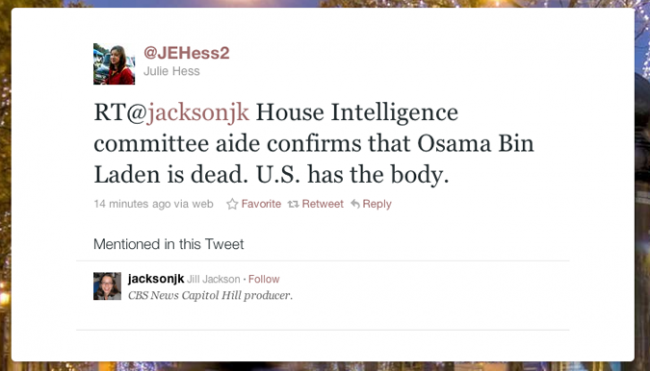 The tweet that informed me of Bin Laden's death. Just a few minutes after I go on a mad fact-checking search through the New York Times, CNN, and other tweets, the deluge of texts from friends spreading the word starts. Within 10 minutes of the White House saying so, millions – maybe billions – of people know a piece of information. The incredible part of this in my opinion is that this didn’t start while people were paying attention. It started on any normal Sunday evening. Now I’m just watching TV, waiting for the official announcement.